To artificially force Kalanchoe to bloom is impossible: even the most experienced grower will not be able to cheat nature, which only defines his term. However, take care of the most favourable flowering conditions capable of that. It is enough to observe a few simple rules. Kalanchoe create favorable conditions. Gentle care, regular watering is the key to the health of any plant. Kalanchoe does not like too much water. It should be watered about once a week as drying of the soil. Need to replant Kalanchoe at least once a year in autumn or spring. Special attention is required and the soil must be well drained. Do not forget that excessive care and the "overfeeding" with organic fertilizers or a mixture of mineral salts only slow down the development of the flower. Especially reverent attitude requires Kalanchoe, just with the buds. At this time it is better not to move the pot, turn it to light the other side and not fertilizing. Trust nature to do its work. Keep your plant short daylight hours. To bloom, Kalanchoe, you must be in the dark no less than 8-12 hours. Thus, at night it is better to hide the flower in the cupboard, and in the morning put back on the windowsill. This method is not ideal because the flowers are not too fond of, when they often move. Replace the Cabinet may be made from black paper cover, which should close the plant. It stimulates flower formation of buds. Ensure that the flower was getting enough fresh air. In summer, place the pot at the open window, leaving it outdoors day and night. The evening temperature drop has a beneficial "training" effects on plants. 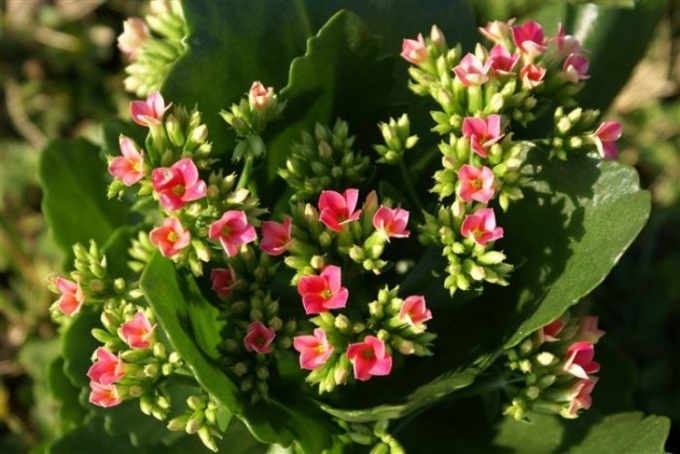 Fresh air prevents the appearance of Kalanchoe diseases and accelerates flowering. Briefly, trim the Bush after flowering. Cuttings can take root. Wait for a few shoots and pinch each one on a fourth sheet. A few months prior to the expected flowering take the pot with a flower in a dark place and provide scant watering. Again returning the plant to the light, at the same time start to water it more actively. Combine it with a little dressing. Periodically molagavita Kalanchoe. Best root apical shoots, which should be put into the water before the emergence of roots and then transplant into the ground. Should from time to time to pinch off cuttings. Pot Kalanchoe should not be too broad. In large pots the flower grows slowly and poorly flowering.